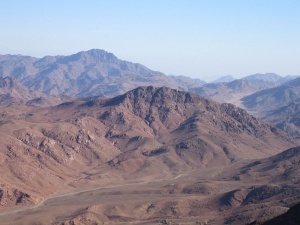 View from the Summit of Mount Sinai. Mount Sinai (Hebrew: הר סיני, Har Sīnạy; Arabic: طور سيناء, Toor Sinaa'i) is the name of a mountain in the southern Sinai Peninsula where, according to the Bible, God met with Moses and established His covenant with the Israelites. It was here that God personally carved the Ten Commandments on tablets of stone and gave them to Moses along with instructions for the building of the tabernacle. Many scholars and local religious groups identify Mount Sinai with Jabal Musa (or Gebel Musa). The name of this mountain in Arabic name means Mount Moses. It is a large rocky protuberance between the Red Sea and the Gulf of Aqaba (location from satellite), which is 2,285 meters high (7,500 feet). Others put Mount Sinai further north; still others in Arabia. 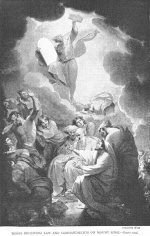 Moses Receiving Law on Mount Sinai. This page was last modified on 9 February 2013, at 15:49.